I rant and rave about it all the time, but I really would be a miserable person, mother and wife without our Chariot. Ian has been away since Monday morning and won’t be back until late Sunday night. For many people this would mean either no exercise or a lot less. Not for me thankfully. I have been able to get out with the kids in the Cheetah 2 for runs all week logging 6, 7 and 10 mile runs. 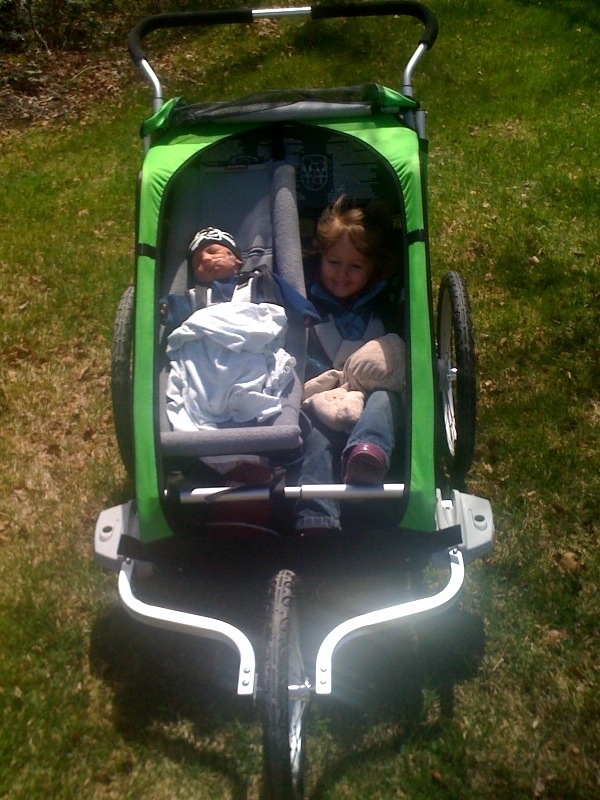 Juniper continues to amaze me by asking to go running so she can be in the Chariot with Axel. I’m not looking forward to it but I know being a big sister will eventually wear off. Meanwhile, I’m taking advantage of the ease of the two happy kids in the Chariot while mom gets an extra workout pushing 50+ pounds while running. It’s got to be doing something extra for me and helping me get back in shape after delivering Axel. Don’t get me wrong, I’m excited for Ian to come home so I can also ride my new bike. I’m just so thankful to be able to get out and train while he’s away and to know I am teaching my kids a healthy lifestyle. Good on ya Sari! I love my Chariot too. I hope Reed will continue to enjoy it as much as Juniper does!